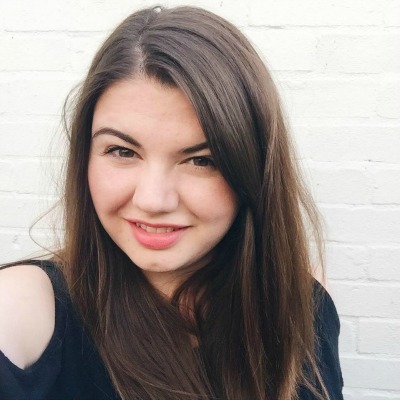 Back when I was pregnant the two things that scared me about having a baby were giving birth, and then the fact that at some point we would have to do potty training. I figured I would just wing everything else in between. I'm not sure exactly what it was about potty training that worried me, but it's always felt like this big thing we would one day have to tackle. Now that Zach is almost two and half that day is pretty much here, and we have just begun preparing for potty training. I had been worried that Zach's speech delay might set him back a little bit, but I couldn't have been more wrong - it turns out that he is more ready for potty training than I am! The lovely people at Oxo Tot kindly sent us a 2-in-1 Go Potty to try out, which is designed to for use when you are on the go. 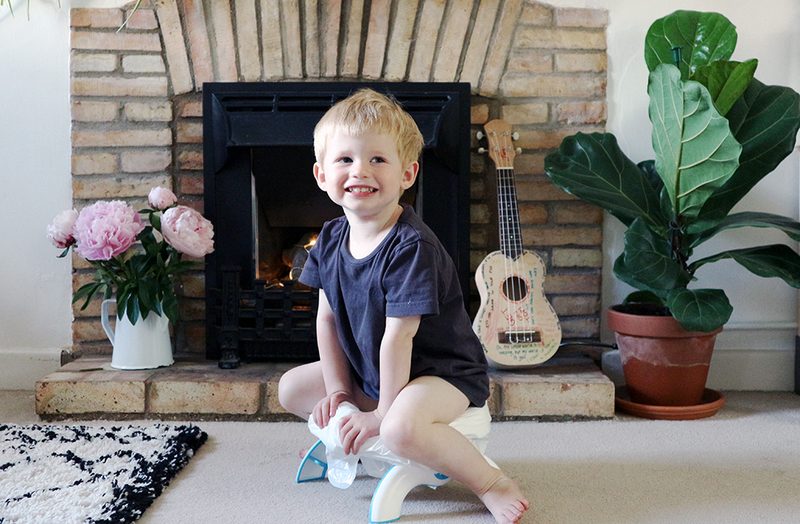 It works both as a potty and as a toddler toilet seat, and over the past few weeks Zach has been putting it to the test. The potty itself is designed to fold flat, and comes with a bag to store in it, so that you can transport it easily. This means it fits in the bottom of a pushchair without it taking up much space. To use it you simply unfold the legs and attach one of the bags using the holes on the sides. The bags have an absorbent pad at the bottom to make them mess free, but only three are provided so you would need to buy more. 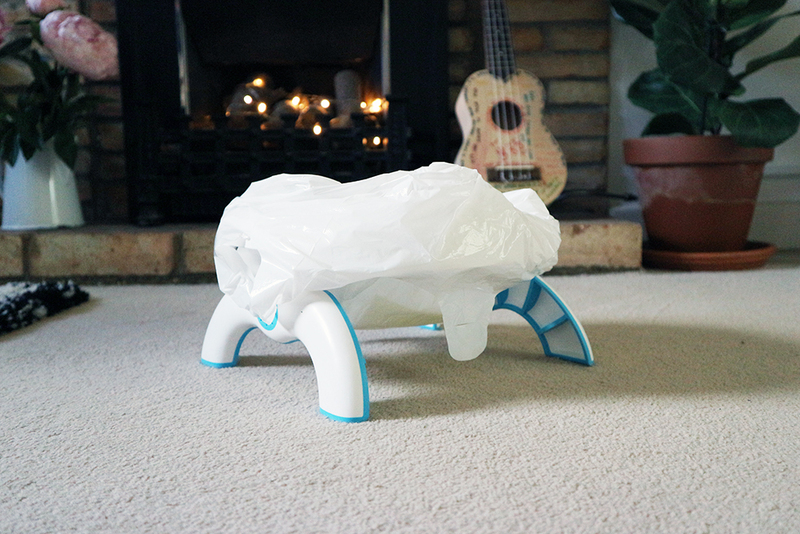 You could make your own with carrier bags, or even a roll of small bin bags, so that is something to bare in mind. On the one hand I think that the idea is absolutely brilliant. This potty would be perfect for emergencies when you're out and about, and I love how transport friendly it is. On the other hand though I'm not keen on how much waste it creates. We use disposable nappies, so I'm definitely not one to judge, but I was looking forward to reducing the amount we send to landfill once Zach is potty trained. Also, the refills are really expensive at £5 for 10, or £13 for 30. 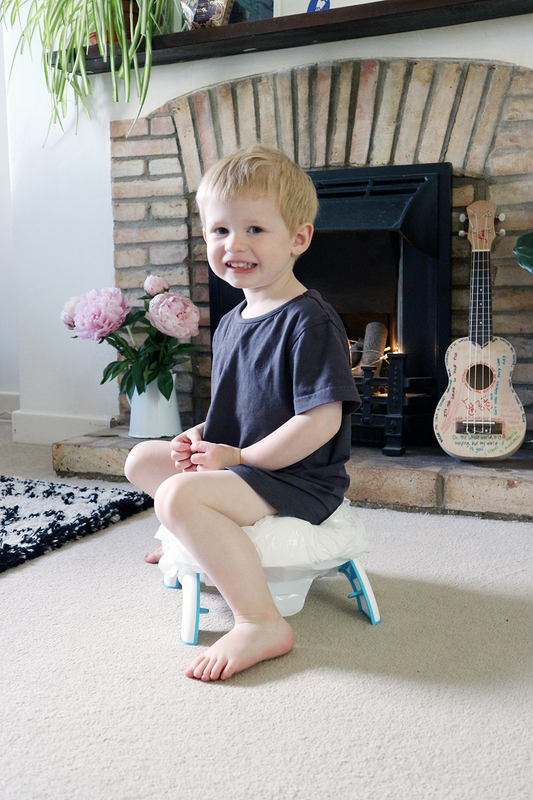 The potty can also be used as a toilet topper to make a toddler friendly seat. This is something that we will use as we transition from the potty to the toilet, and I think it is absolutely great that it has the dual function. 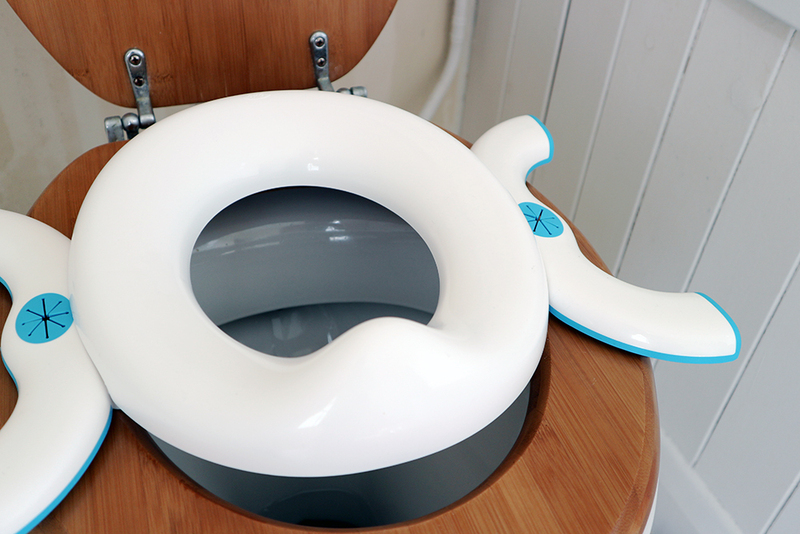 The seat doesn't fit our toilet seat perfectly, but as it is designed to be universal it will probably fit all toilets differently. I found that it worked best sat closer to the back of the toilet, and once it was there it was surprisingly sturdy which is super important with a wriggly toddler. 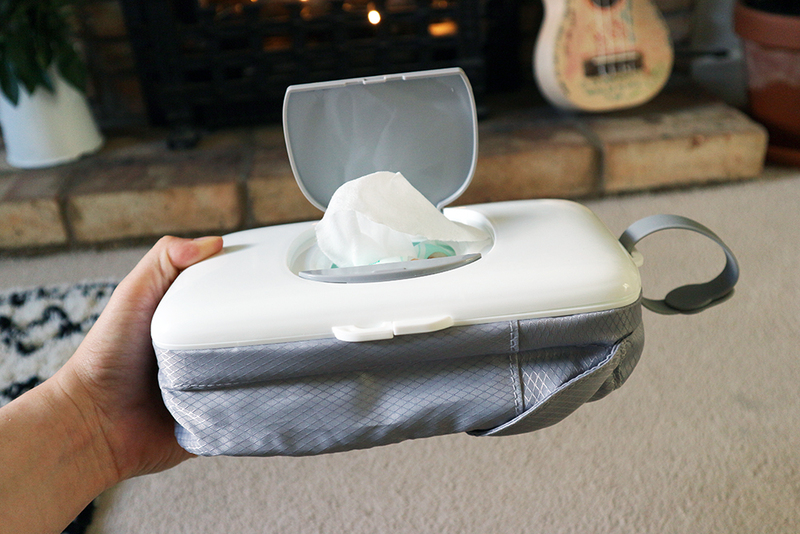 Oxo Tot also sent us an On-the-Go Wipes Dispenser with Nappy Pouch which is amazing, and I wish we had bought one of these when Zach was a newborn as it is so handy when you are out and about. The concept is so simple, but so effective. I love that it has a handle, which means if we're just popping out to the shops we don't need to take the whole changing bag, and I can just pop the pouch on the pushchair. Overall we were really impressed with the products, and I we are planning to keep the 2-in-1 Potty in our car for long trips. The On-the-Go Wipes Dispenser is already in our changing bag, and it has been really fab when we're in restaurants and I don't want to take the whole bag into the toilet. Zach is doing really well on his potty training journey, but as we are going away camping for a week we thought we would wait until we got back to do it properly (there is absolutely no way I am teaching him to use the potty in a tent!) He's started to tell us when he wants to use the potty and finds it really exciting when he does a wee on it! So, hopefully it will all go smoothly, and Zach will prove that really I had nothing to worry about. And please leave any potty training tips you may have in the comments, as I would love to know them!